Not so long ago it looked as if decorative luminaires manufacturers would fall behind the producers of technical light. The reason for the widening gap was an EU Directive stipulating that light bulbs be gradually replaced by other, more efficient illuminants. 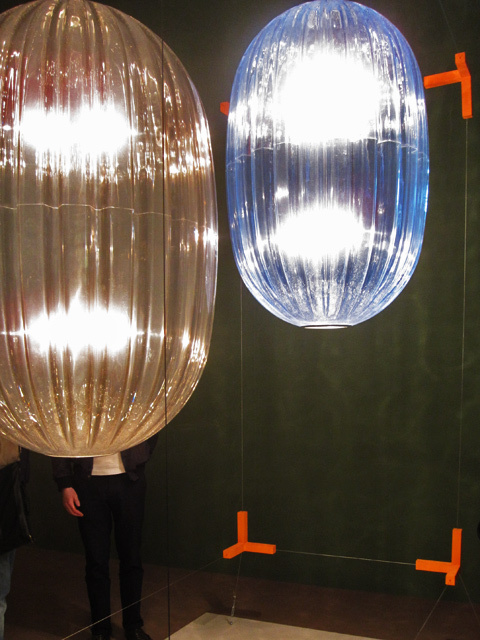 A certain perplexity was palpable at the product shows hosted by the luminaires industry. Those companies with a stronger focus on technology, however, had long since been grappling with the measures of Lumen and Watt, in other words, the question of luminous flux and energy absorption in luminaires. With the increasing permeation of technology in the electric light industry the question of color reproduction also began to play a role. In short: Those manufacturers who intensely focused on technology were in with a head start, leaving the decorative luminaires had to catch up. 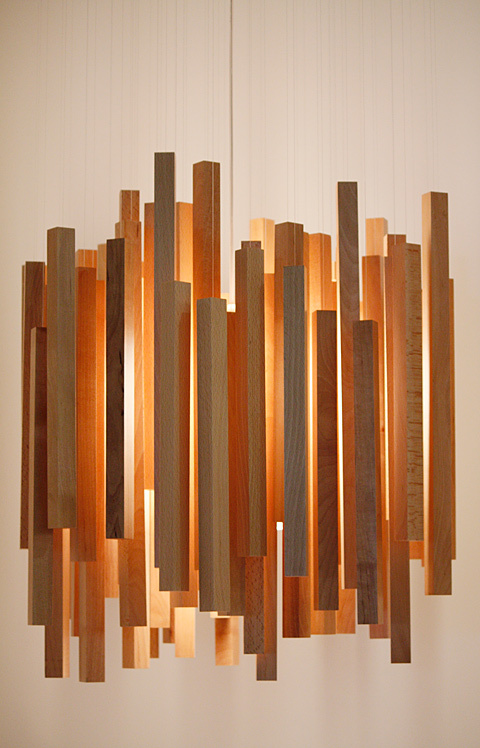 By contrast, this year’s Euroluce virtually radiated an air of serenity. The balance between technicians and decorators seems reestablished for the time being. Many questions remain unanswered nonetheless: What to do with all those excellent luminaires, for example those of Italian design produced from the 1960s to the 1990s, which depend on conventional illuminants? The attempt of replacing bad with worse has evidently turned out unsuccessful. 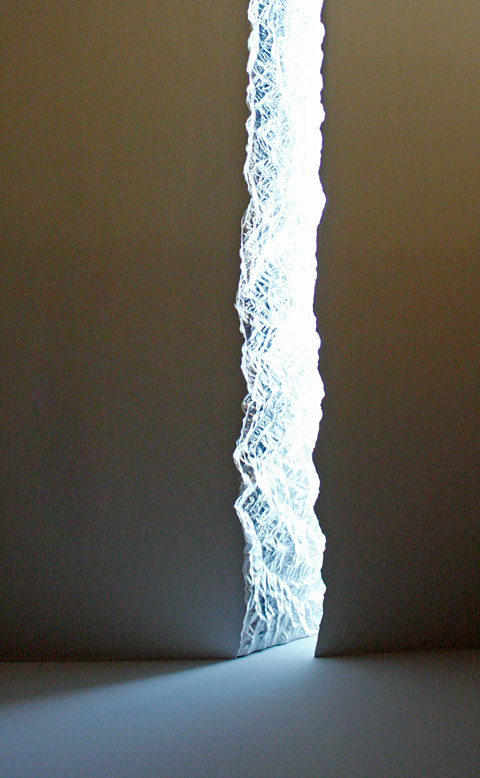 The compact fluorescent lamp, also termed energy-saving lamp, as the supposed Jack-of-all-Trades has trashed its reputation within a very short time. There is much to be said against it, even if some environmental protection agencies still deem it indispensable because it is energy efficient and less damaging to the environment as a result. 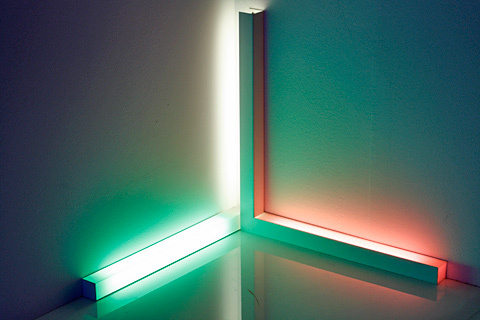 First, they look ugly, as they consist of minimized fluorescent tubes that are either hidden in a housing or bent as tubes and left as exposed loops. Second, they are too expensive. 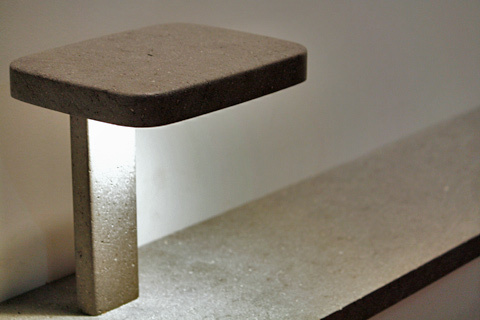 Third and light planner Peter Andres calls this the “lived lie of the energy saving lamp” they buy their lower energy levels by only offering certain peaks of the visible light spectrum between 380 and 780 nanometers, which saves energy but considerably reduces the quality of light. Forth, each compact fluorescent lamp contains at least two milligrams of mercury, the lesser quality products as much as 10 milligrams, and it is well nigh impossible to remove it from the twisted tubes (cf. : one milligram is enough to render 5,200 cubic meters of water toxic). The “most poisonous non-radioactive material”, namely mercury, is not even worth a mention in the DGNB’s sustainability assessment, Andres reports. Fifth, some models release phenol vapor owing to the adhesives used to glue together the individual sections of the lamps. Sixth and finally, as so often is the case with autos, the consumption readings given for the compact fluorescent lamps are in part presented as better than they are. The data stated on the packaging is not always actually replicated when it comes to both service life and electricity requirements. But what comes next? 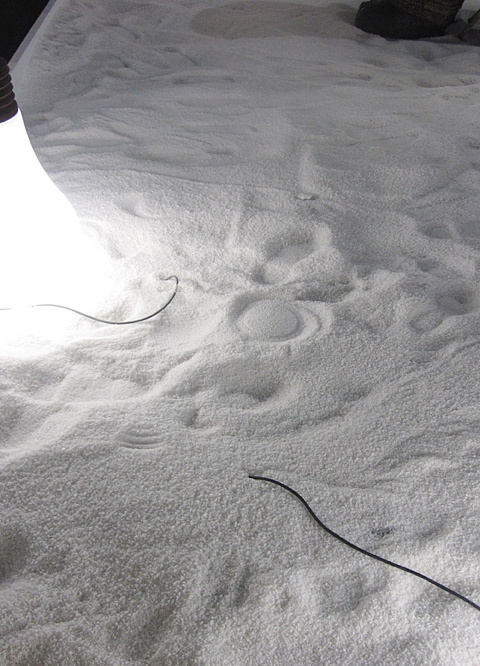 Light emitting diodes (LEDs) are increasingly catching on as an alternative to the light bulb. Many light planners and designers insist upon paying attention to the quality of the light in addition to its efficiency. And yet: “Buying a lamp was never as difficult as today,” the German testing agency, Stiftung Warentest, stated recently. 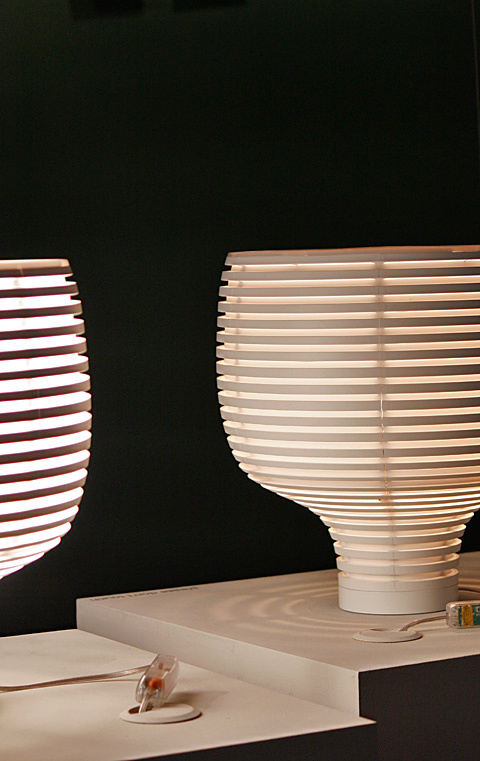 While the London-based designer Mathias Hahn argues for a “human right to light”. Just like heat, food and water, light constitutes one of the “existential needs of man,” says Hahn, regretting that the evolutionary process that for example in the case of the telephone went from dial to touch-tone telephone to mobile phone was artificially stopped for light. According to Hahn, banning the light bulb would not only have a negative effect on the quality of artificial light, but most of all on the price. While it used to be possible to purchase a light bulb for just a few cents almost anywhere in the world, top quality LED replacement bulbs nowadays change hands for a whacking 50 euros. A drastic cost explosion if there ever was one. And what’s adding to the list of problems of the new light technology: The screw thread on the light bulb were internationally standardized, making the light bulb a universal object. Admittedly, the LEDs produced today last considerably longer under ideal thermal conditions, but there is no standardized interface for replacing the illuminants. 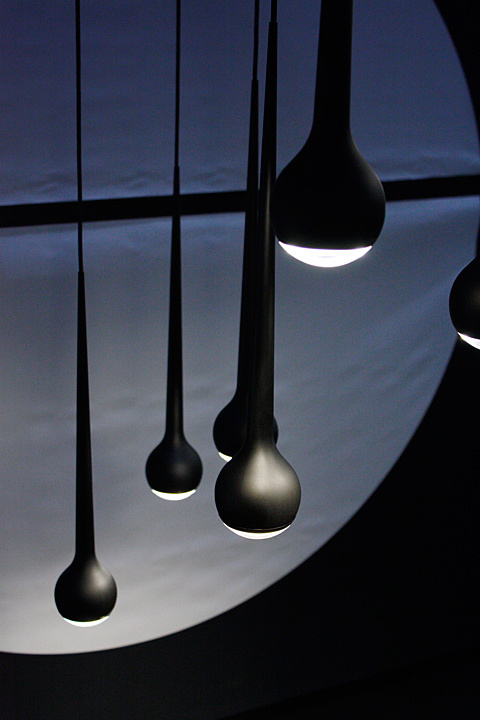 The innovations presented at the 26th Euroluce are anything but spectacular. They nonetheless illuminate the current trends and alternatives. For many years, a systematic coherent design, boasting a flush and self-contained form, was deemed the non plus ultra. It was meant to replace additive design, whose interchangeable components are linked with one another. 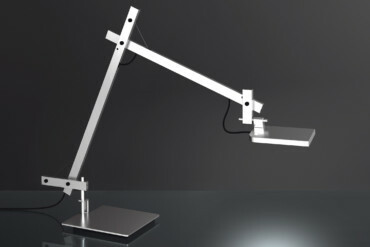 “Lotek”, the fanciful desk luminaire designed by Javier Mariscal for Artemide, seeks to provide proof of the contrary. The result was presented at the trade fair stand as if it were a student project. Mathias Hahn used a similarly playful approach for his “Scantling Light family” (for the Spanish luminaires company Marset), for which he combined wood and metal and which he showcased as part of his Berlin installation “Poetry Happens” in Lambrate. The relatively young company Foscarini showcased a wealth of innovations and approaches in Milan. 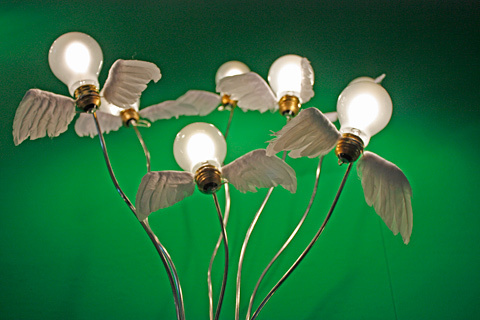 Their designs work with conventional light technology – halogen bulbs or compact fluorescent lamps are used as options. What counts is the artful construction clad in an unconventional form. Eight new products alone were presented at the trade fair stand. Each was accompanied by a short video statement from the respective designer, almost like in a museum presentation, which sadly did not work in the busy context of the trade fair, however. 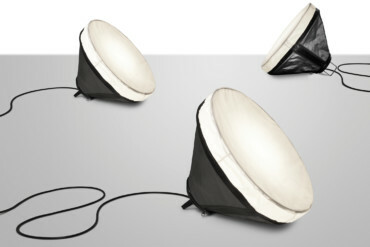 For example, the “Planet” spherical luminaire, formulated as a textile object by Italian studio Changedesign. It is fitted with a strong halogen or compact fluorescent lamp. 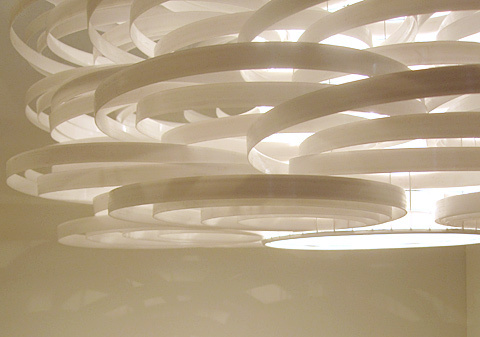 Despite its large diameter spanning up to 80 centimeters the lamp needs no interior supports. The textile cover is embroidered all around in white or red thread. When switched off “Planet” has a neutral appearance, when illuminated the constructive threads make for a functional decor. 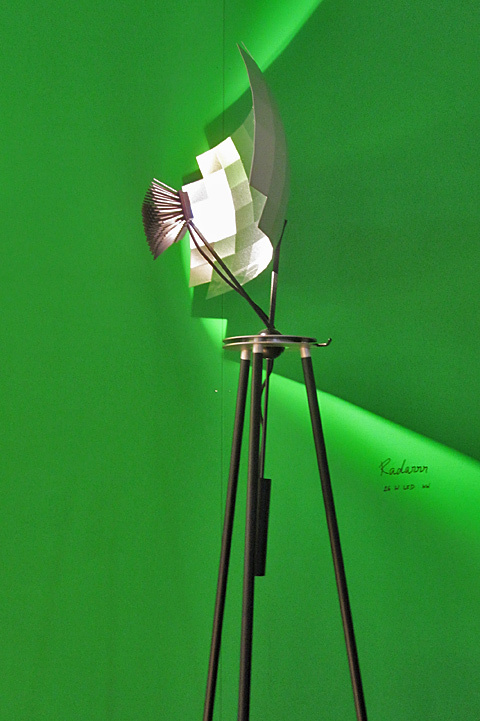 Foscarini staged his own range of luminaires at Superstudio Più. To this end, seven models, or 464 lamps in total, were taken apart and all the components rearranged. 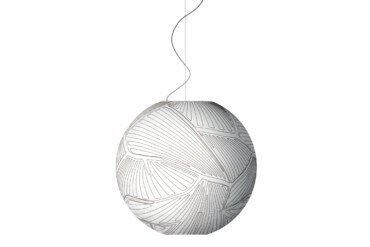 Foscarini moreover added new models to the “Successful Living” home collection. 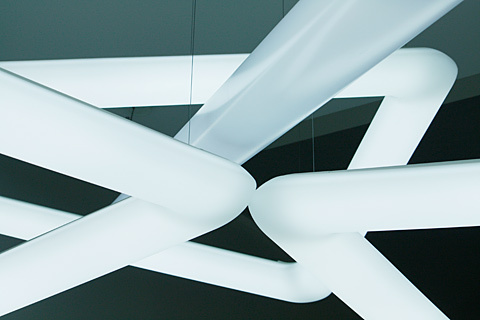 For Hamburg-based luminaires company Anta the interior designer and designer Siw Matzen conceived “Puk”, a luminaire communicating understatement. The height of the metal housing, painted white on the outside and purple on the inside or gray-brown on the outside and white on the inside, is adjustable. At the smallest setting hardly any light escapes the narrow slot, while at the largest setting it shines down inside the large lampshade. To achieve this effect a 75 Watt halogen bulb is required. 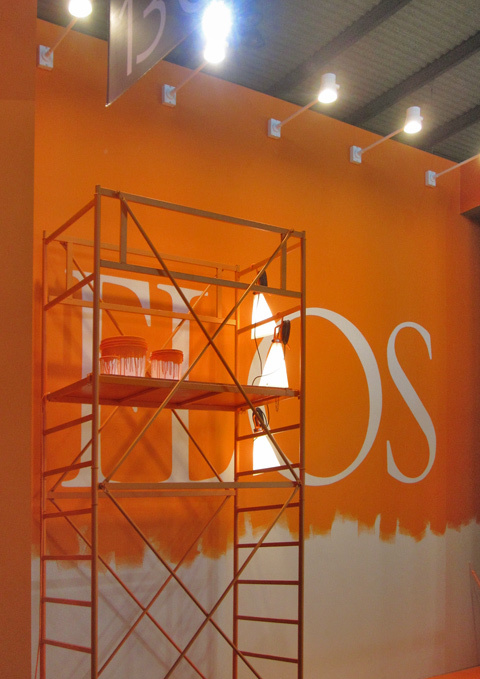 Flos has construed its own trade-fair stand as a large conversion project, which is why the entrance features life-size designers as painters in white overalls. Many of the new items here come with LEDs. The one or other wall luminaire for indirect light, such as “Beaker” by Edward Barber & Jay Osgerby or Piero Lissoni’s “Tish” and “Tyl” generate a marvelous 980-1,100 Lumen although they require only 60 or 14 Watts respectively. The novelties also include pretty dim lamps, such as the refined and small “Piani” model created by Ronan & Erwan Bouroullec – said to be available in versions made of plastic, oak and basalt. It exudes wonderfully accented light, but does not diffuse brightness. 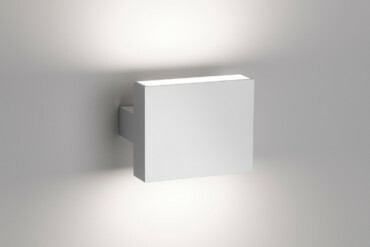 Flos continues to plug for luminaires that can be flush-mounted beneath the plaster. One is called “Wall Rupture” and was launched at Art Basel Miami Beach in December – it ruptures the wall and the tear then gleams golden or silver. Reminiscent of the 1980s notion of design? So how’s Luceplan doing after being bought out by Philips? After all, hitherto it was one of the main sources of new ideas in the West. “LED by Ideas” is the company motto. The (no longer quite new) plastic candelabra “Hope” still glitters in the light of a halogen lamp. The best of this class are “Otto Watt”, a no-frills work luminaire devised by Alberto Meda and Paolo Rizzatto, whose name makes it clear how little energy it requires and the color temperature of which can be adjusted at the lamp head. “Synapse” serves mainly decorative purposes – it is a construction made of polycarbonate discs that creating a dull gleam thank to colored LEDs. In one part of the trade fair where the decorations tend to outweigh things and technology is at best hidden, Czech company Lasvit has fielded a “fairytale forest”. The firm is fully in the lineage of glassmakers from Bohemia and is represented in Singapore, Shanghai and elsewhere internationally where clients want customized large-size impressively glass light cascades installed. 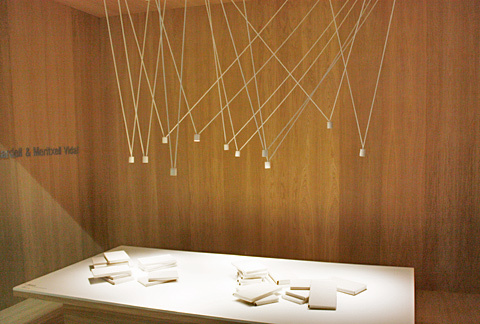 Lasvit primarily employs Czech designers such as Jitka Skuhravá or Olgoj Chorchoj, yet in the Zona Tortona Mathieu Lehanneur, Nendo and Fabio Novembre also provided installations. The three have come up with objects that seemingly freeze the fleeting dynamic processes and render them eternal in illuminated glass objects. Major corporations such as Zumtobel and Philips presented new products in Milan as if all there was now were LEDs. Philips showcased different residential and office scenarios, each with specific lamps. Companies such as Ilti Luce, Luceplan or Supermodular (they’re all part of the Philips’ lighting division) had their own independent product shows and rarely referenced the group itself. Zumtobel offers new spots and products for upgrading to LEDs – energy saving solutions for offices and shops. Tobias Grau has successful morphed from providing essentially bespoke lighting solutions for the private setting into a technically innovative all-round provider. He is increasingly relying on the latest LED technology. Grau’s expanded his “Falling” series, alongside a table lamp there are now versions for ceiling/track mounting and in satin black. LEDs instead of fluorescent lamps are now also used in the XT-A office luminaire. It boasts 1,000 LEDs at a total of 170W, has various control features and settings, and delivers real brightness, peaking at a lux of 10,250 Lumen. The Alessi design principle has been extended to include the sphere of light. 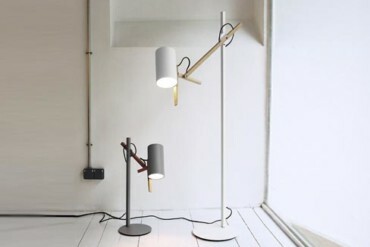 The AlessiLux collection was produced together with Dutch makers ForeverLamp. 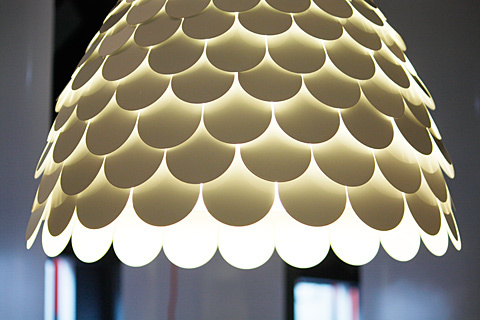 It consists of retrofit LEDs whose outer shape is derived from the established teardrop shape. 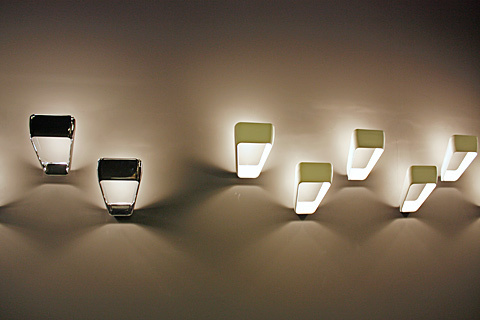 The first series consists of seven different lamps in different colors that meld with three luminaire types to offer pendant, wall-mounted and table lamps, and in each case the lamp remains visible and no shade is included. 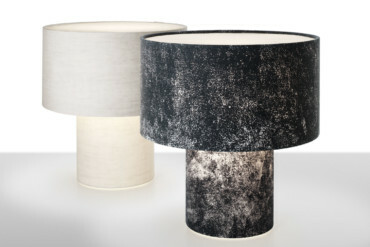 Frederic Gooris, Giovanni Alessi Anghini and Gabriele Chiave came up with the designs. This time round, the Svarovski Crystal Palace experimental lab with its spacious light orchestrations was not in Milan. Baccarat proved to be a worthy successor – there, Jaime Hayon, Arik Levy, Philippe Strack and others presented a new luminaire collection. 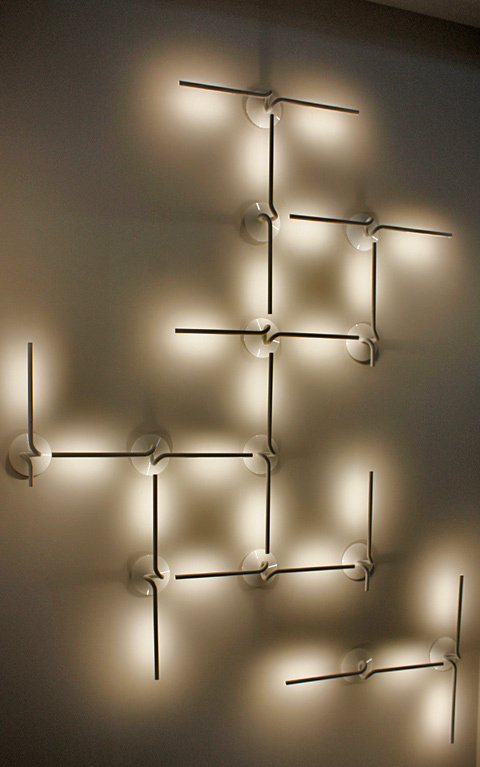 Back in 2007, Ingo Maurer presented as a vision wallpaper with integrated LEDs. It has now progressed into a product, albeit one that is especially challenging to make and assembly. Each strip of wallpaper has five patterns. Each pattern has a total of 168 LEDs, controlled by a ballast. 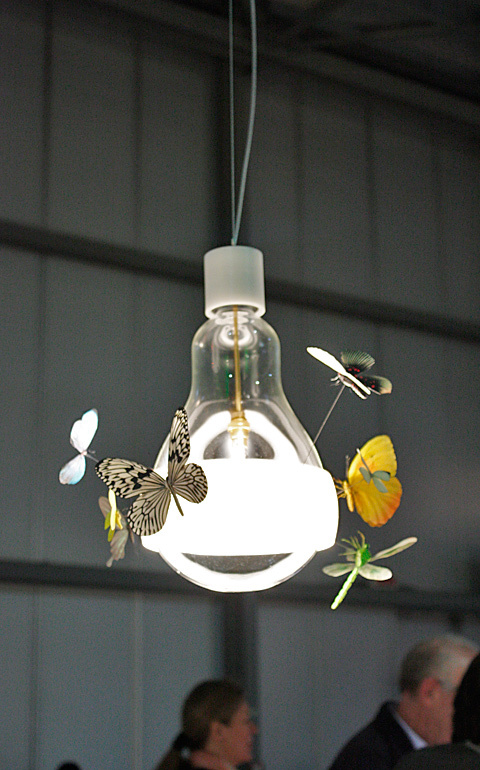 And with “Johnny B. Butterfly”, once again Maurer focuses firmly on the lamp. As good as unaffordable handmade insect models hang from a Teflon anti-dazzle ring. And thus we buzz around the light.